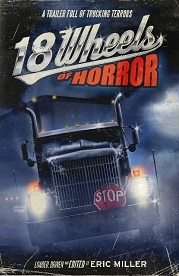 A long-haul truck driver reluctantly agrees to handle the delivery of a stolen creature from a top secret government laboratory. What seems like a simple load-n'-go turns into a high-speed chase filled with death and deception. "I was a kid in the era of trucker and road movies … Convoy, Cannonball Run … I remember Burt Reynolds and his ‘stache, BJ and his Bear … I remember wishing we could have a CB radio and be all cool … I remember making wild air-honk gestures at passing big-rigs on long road trips, and the glee with which we’d greet each successful blast.